Though I was not in constant contact with Brahmananda Prabhu I always had great affection for him and Gargamuni Prabhu, the “love brothers” because of their unflinching faith in and pure unalloyed love for Srila Prabhupada. 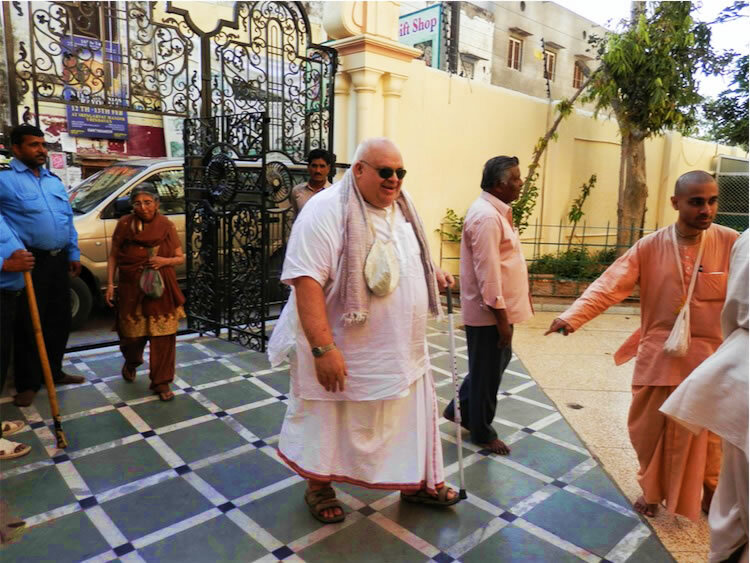 Brahmananda Prabhu was archetypal of what it meant to be a “Prabhupada man.” He would take a bullet for Srila Prabhupada and be happy to have had the opportunity. For several months I had the urge to contact him but didn’t as something else would come up and now I am deeply regretting that I didn’t. 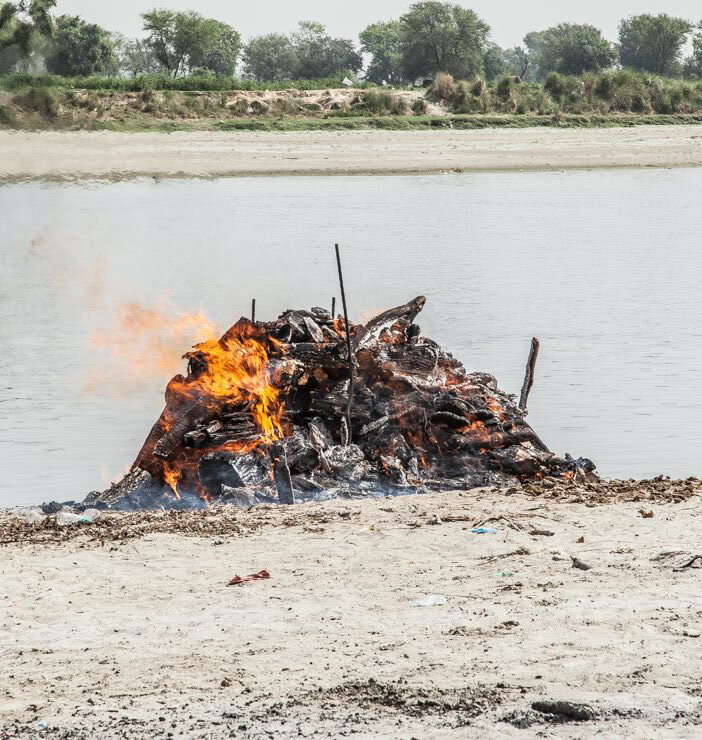 I should have listened to that little voice like I did when I went to Vrndavana in 2008. I was having darshan of the Deities and was trying to make appropriate prayers to Them but I realized that in reality I don’t have a direct connection with Them. That it is Srila Prabhupada who is my direct connection to Sri-Sri Radha-Shyamasundara, Sri-Sri Krsna-Balarama, and Sri-Sri Gaura-Nitai, so I needed to focus on him and get his blessings. 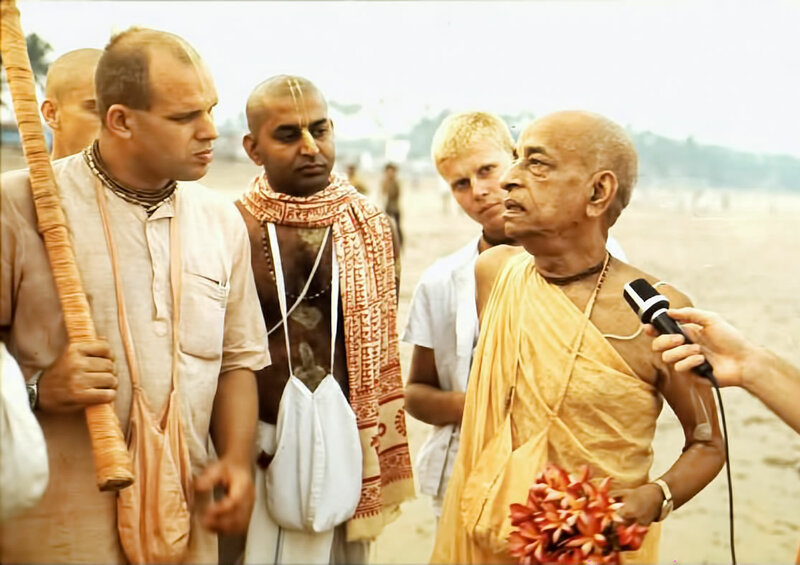 Shortly after this that little voice told me “go find Brahmananda and Gargamuni.” So I went to find the “Love Brothers,” the name they called themselves when they toured the US in the 1990s distributing Prabhupada mercy wherever they went. When I arrived at their domicile they very graciously welcomed me and it felt as if I had just returned after stepping out for a moment rather than it being more than ten years since last seeing Brahmananda and even longer for Gargamuni. We then spent several sweet hours discussing about Srila Prabhupada. The time I spent with the “brothers” was the highlight of my visit. I then realized why that little voice told me to find them. So I was very sad to hear of Brahmananda's sudden departure and basically the rest of the week I was in mourning and watching videos of Brahmananda Prabhu on YouTube. 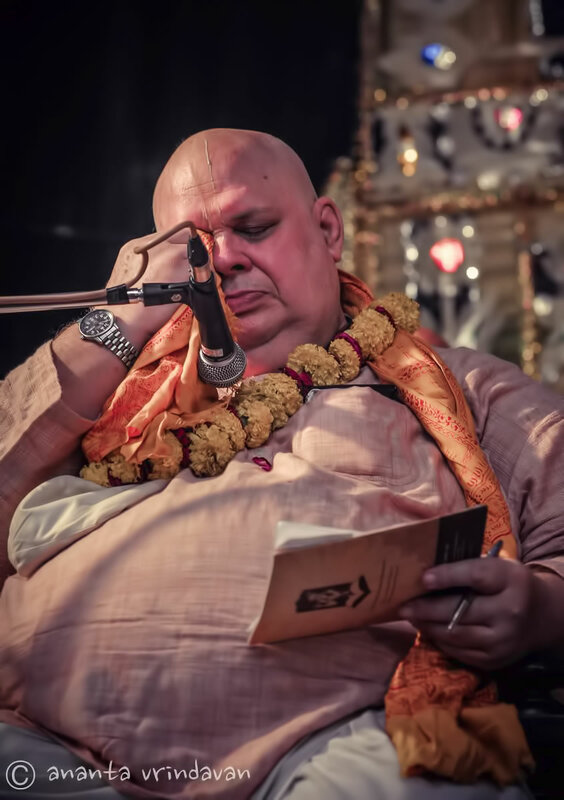 If I felt terrible I cannot even comprehend how Gargamuni Prabhu is feeling and my sincere condolences to him who has lost not only a brother and god-brother but also his vartma-pradarsaka guru, who brought him to the lotus feet of Srila Prabhupada. 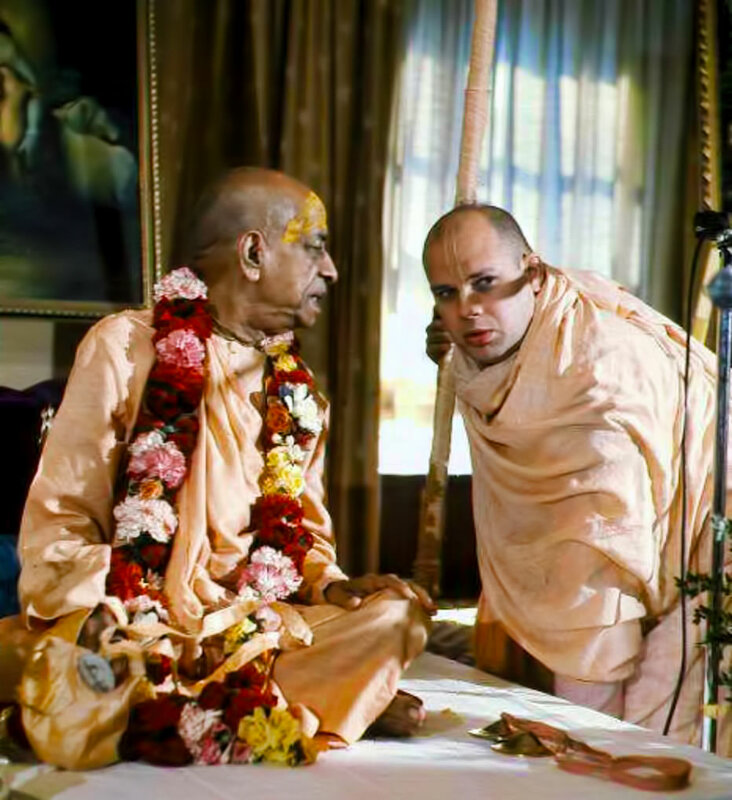 I don’t recall the first time that I met Brahmananda Prabhu but I do recall the first time I sensed that he had a very special connection with Srila Prabhupada. It was sometime between 1978-80 in Mayapura when he was giving Bhagavatam class. As he gave the class somehow the topic turned to Srila Prabhupada, Brahmananda’s voice started to choke up, I could see that he was struggling hard to control his emotions and continue with the lecture, but eventually he lost the struggle and began to openly weep and that was the apparent end of the class – but a very deep lesson for me. He was not putting on some cheap sahajiya exhibition but had very deep love and affection for Srila Prabhupada, a love that was palpable despite his efforts to hide it. And over the years the more I got to know Brahmananda Prabhu the more I appreciated that he was like the personification of love for Srila Prabhupada. And, though he was very senior to me in every possible way he always treated me with affection and respect. I never once felt that he was patronizing, arrogant, pulling rank or had a sense of superiority, importance or entitlement. In fact I found him to be learned on various topics but humble and kind, a quality we can all emulate with profit. I remember how sometime in late 1993 that Brahmamnada had fulfilled Srila Prabhupada’s promise to Sudama Prabhu. Back in the early days Srila Prabhupada told Sudama that if he started a temple in Japan (which he did) that Lord Caitanya would personally take Sudama back to Godhead. After Srila Prabhupada left this world Sudama Prabhu became a casualty in the war against maya. He eventually contracted HIV and came down with AIDS. He was dying a long, slow and miserable death. Brahmananda Prabhu heard about this and was very concerned that Sudama Prabhu should be taken care of and leave his body in Krsna Conciousness because of the sacrifices and hardships he had endured to please Srila Prabhupada. So on behalf of Srila Prabhupada (who is not an ingrate), Brahmananda and another devotee searched all over the Bay area for Sudama Prabhu and finally found him in what can only be described as a “hell hole” flophouse living in filth and squalor (he was unable to care for himself because of his illness) and whose other residents included drunks, junkies and other seriously crazy and haunted people. 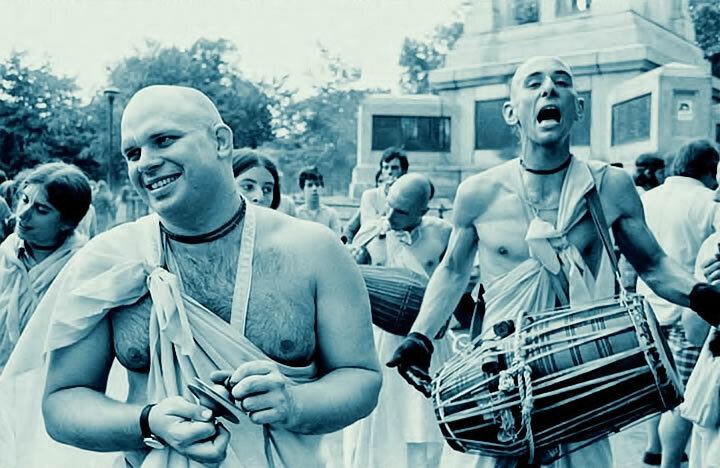 Brahmananda, inspired by Guru and Gauranga, took Sudama from this utterly depraved bedlam and brought him to New Dvaraka in Los Angeles where the devotees, especially Omkara Mataji, personally took care of him until he left his body in an auspicious manner, thus fulfilling Prabhupada’s promise. Read Omkara Mataji's inspiring history of taking care of our brother Sudama Prabhu and helping him to go back to Godhead. This would not have been possible if Brahmananda Prabhu, out of the sheer goodness of his heart, had not taken it upon himself to search for and rescue Sudama. Not all of Brahmananda’s talks about Srila Prabhupada ended abruptly as happened in that class in Mayapura. Once in 1995 in Alachua Brahmananda gave a “Prabhupada remembrances” talk. I could see that when he was speaking about Srila Prabhupada his eyes would get moist but they would also light up and he would become very animated and happy, he was practically effulgent. He told several stories but the ones that I remember (details fuzzy after 20 years and open for correction) was one about how Srila Prabhupada became gravely ill and they tried to find a physician to come and see Srila Prabhupada because he didn’t want to go into a hospital. It was next to impossible to find a doctor who made house calls especially since it was a public holiday. Miraculously Brahmananda and other loving disciples were able to find an older but somewhat crotchety doctor who came to see Prabhupada. 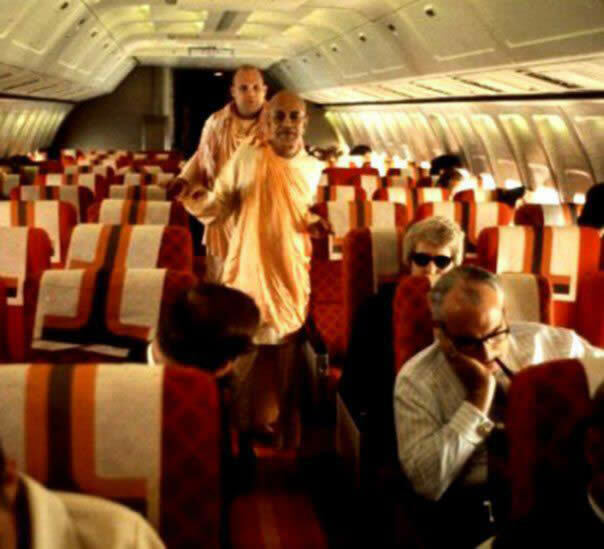 He made his diagnosis and added in regard to Srila Prabhupada’s condition that “his problem is that he prays too much, he needs to get some exercise.” The devotees were aghast that the doctor could say such a seemingly disrespectful thing and made their displeasure known. But Srila Prabhupada interrupted them coming to the doctor’s defense saying, “the doctor is right, I need more exercise all my blood is blocked up from sitting too much.” Brahmananda told us it was after that incident Srila Prabhupada started his regimen of robust morning walks to get his blood flowing. Speaking of Boston harbor, over the years, ever since I had began to study Vedic astrology in 1977, many devotees, big and small, have asked me what the future of ISKCON was, based on its horoscope. I couldn't make any predictions because I couldn't establish a time of birth for ISKCON. I had tried, unsuccessfully, to find out the exact time of incorporation. Then in early October of 1990 Brahmananda called me one evening. He was going to write an article for BTG about Prabhupada's arrival in the USA and he asked me to help him by providing an analysis of the astrological ambiance of that time. Prabhupada's diary provided all the necessary data for the calculations. He arrived in Boston Harbor on September 17, 1965, at 5:30AM. Here is a diagram for the basic Rasi chart. Click to see a larger image. I am not going to comment on it, I have done so at length on other fora. But one interesting bit of information is that ISKCON’s Rahu period (generally considered to be inauspicious) started on July 13, 1977 within days of the famous and much politicized “Rtvik” letter, the keystone of the Rtvik heresy, and just a few months before the departure of Srila Prabhupada. 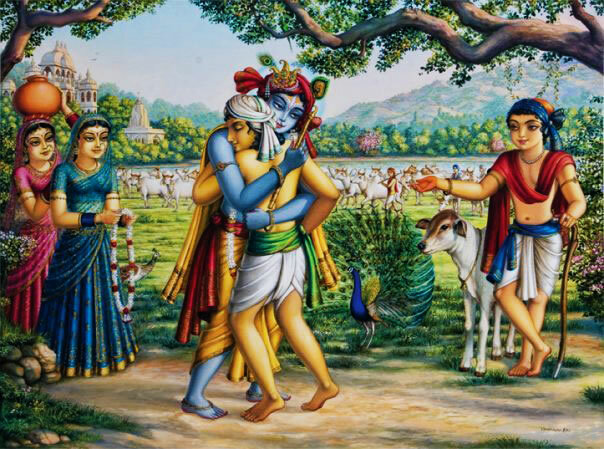 That Rahu period was an extremely difficult time in ISKCON’s history. 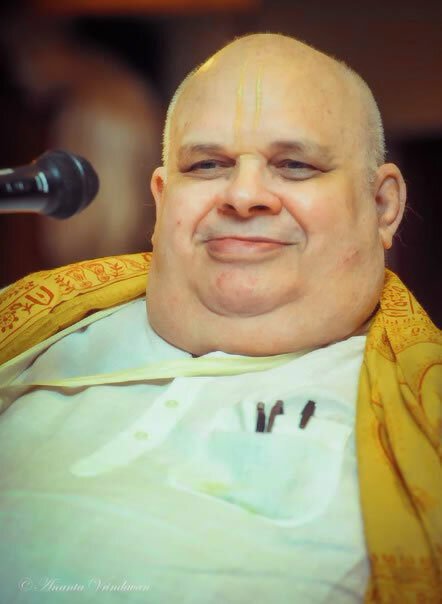 The main point however is that Brahmananda Prabhu was instrumental in discovering ISKCON’s horoscope. 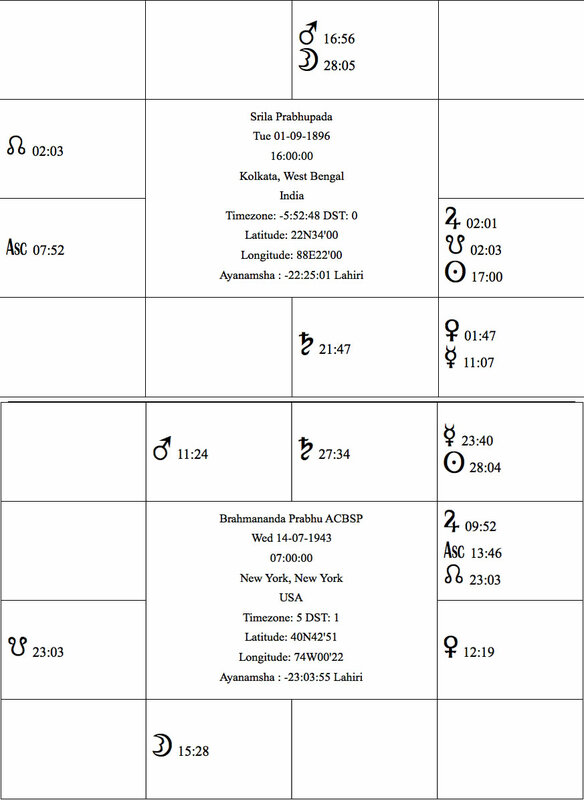 Brahmananda Prabhu shared his birth information with me, here is his chart. Click to see a larger image. The birth time seems to be an approximation but still reveals a lot. I will not do a lengthy analysis as this is not an astrological forum but here are a few points to note: the Lagna (rising sign) and Lagna lord and two other planets are in water signs and the Lagna lord Moon is also vargottama in Scorpio navamsa so he was a person of great sensitivity and deep emotions. (There are several cancellations to Moon's debilitation.) Saturn aspects these configurations so he did his best to cover and control his emotions. In other words the external expressions of his feelings and love for Srila Prabhupada only hint at their real depth. He also has two mahapurusha yogas, Mars in the 10th in his own sign indicating his organizational abilities and why Srila Prabhupada could entrust him with so many responsibilities. And, Jupiter the 9th lord exalted in the Lagna, and also aspecting the Lagna lord the Moon - doubly good, indicating his saintly nature, attachment to guru but not to father (9th lord represents both guru and father but Jupiter specifically represents guru while Surya, the karaka for father goes to the 12th house of loss), interest in philosophy, desire to travel, good sense of humor and jovial nature. Both Mars and Jupiter indicate a courageous soul attached to Guru and who was literally willing to travel and go anywhere. And while Jupiter indicated his deep piety, Budha and Surya in the 12th (moksa-sthana) suggest his lack of interest in material pursuits and search for a higher meaning to life. And, having so many planets in water signs especially with Jupiter (planet of expansion) in the Lagna indicates why he was so huge in size. Compatibility studies are usually done between male and female regarding marriage potential. But they can also be done for any relationship: child - parent, business partners, friends, employer - employee, and student - teacher. So let us now examine the relationship of Brahmananda Prabhu and Srila Prabhupada within the astrological context. Again I will not go into a lot of detail but just give the salient points. Click to see a larger image. The most obvious things that indicate close bonds of sincere love and affection are the fact that their Lagnas are in seventh from from each other as are their Moons. The seventh house in a chart represents (among other things): spouse, lover, close associates, business partners, allies, etc. ; so such placement is ideal for close, harmonious, long lasting relationships. Also Brahmananda’s Jupiter closely aspects Prabhupada’s Lagna from the 7th and his Venus is in Leo with Prabhupada’s Sun, Jupiter and Ketu, all indicating a natural affection to Prabhupada and desire for his well being and happiness. Prabhupada’s Mars closely aspects Brahmananda’s Moon who is also lord of the Lagna indicating that Prabhupada was able to energize and fire Brahmananda up. It is also interesting that Brahmananda’s Saturn is almost exactly conjunct Prabhupada’s Moon. Normally this is not a favorable combination as Saturn is cold and controlling whereas the Moon represents the person’s emotions etc. But we also note that in parent – child relationships that the parent’s Saturn is often very prominent in the child’s chart because the parent is responsible for the child and needs to control and protect the child. So considering that the rest of the combinations are highly favorable this suggests that Brahmananda Prabhu had a very protective, fatherly mood toward Srila Prabhupada, which is further enhanced by the very parental nature of his Karkata Lagna. Mataji Govinda dasi, in her super excellent text, also confirms that Brahmananda Prabhu was very protective of Srila Prabhupada in a fatherly way. And, Srila Prabhupada’s Saturn also aspects Brahmananda’s Lagna so while Brahmananda may have been fatherly there is no doubt who was the guru and who was the shishya. These are the kind of combinations that one sees in couples who met in school and have been married for 50 years after love at first sight. Or life-long friends or long standing partnerships and alliances. They have mutual respect, appreciation for each other and genuinely feel happy, nourished and comfortable in each other’s company. I have noted by studying such relationship charts why some disciples and even grand-disciples are very loyal and devoted to Srila Prabhupada whereas others have acted differently over time. 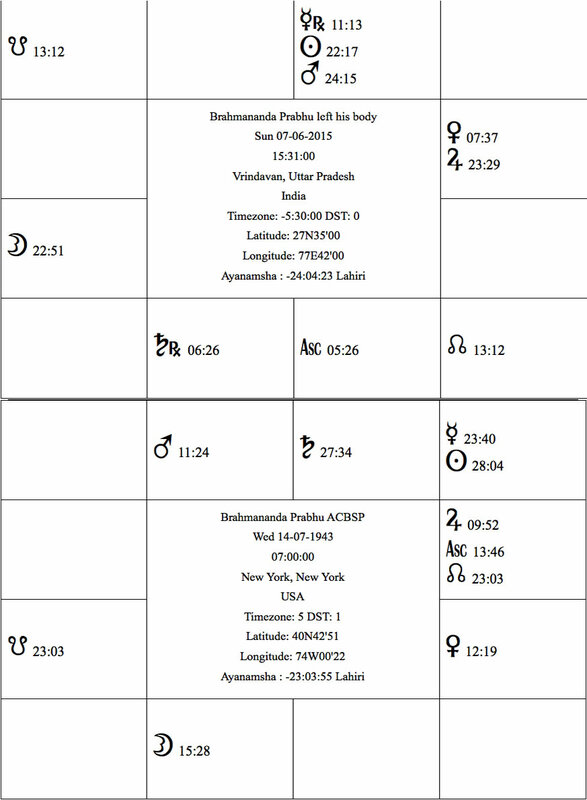 From Brahmananda’s chart we see that he left during his Rahu-Jupiter-Sani-Venus-Sani period. Rahu is a maraka (death inflicting planet) in the Lagna, Jupiter rules the 6th (roga), Sani is always associated with death but even more so as lord of mrtyusthana (8th) and the marakasthana 7th, and Venus is in another marakasthana (2nd) and ruler of the sign that Sani is in. However, since Jupiter and Venus (natural benefics) are involved he had a very short and sudden illness lasting, I am told, less than 24 hours. This is certainly preferable to other possibilities where there is a long, drawn out, lingering, painful death. What is also interesting is the configuration of planets at the time of departure. According to witnesses Brahmananda Prabhu left his body on June 7, 2015 at 15:31 in Sri Vrndavan Dhama. This is the chart for that time. Click to see a larger image. These “transiting planets” (gochara) also have a modifying effect on the planetary periods. There of course are the obvious indicators of death, such as four malefics (Saturn, Mars, Sun and Mercury) afflicting his Moon who is also the chart ruler, these are to be expected. But what is interesting are the indicators of a very quick and auspicious death. First we notice that transit Venus is conjunct his natal Jupiter, this is highly auspicious and under other circumstances indicates joy, happy social gatherings, wealth, enjoyment with friends; basically partying and good times. Also his Lagna (most important point in the chart representing the person themselves) was in a shubha-kartari yoga, by that I mean surrounded by benefic planets. He had Venus 4° behind his Lagna and Jupiter 10° in front of his Lagna, one cannot over state how important that is. Venus and Jupiter are also in the auspicious 9th from the chart ruler the Moon. Also of interest was that transit Jupiter was almost in exact conjunction with his natal Rahu. Why is this interesting? Because in Jyotish texts it explains that when transit Jupiter aspects natal Rahu, that things that were before difficult suddenly become very easy, and that illusion (Rahu) is replaced by clarity (Jupiter). And if that were not enough we note that the transit Moon at the time of death was in Sravana nakshatra whose presiding Deity is Lord Visnu Himself, and in the 6th (sadhaka) nakshatra from his janma nakshatra and exactly aspected by Jupiter (Guru) and also by Venus but Venus’ aspect is not as exact as that of Jupiter. Why is this significant? Because the Moon represents the Manasa – Mind and when the Moon is associated with other planets it colors the mind. Venus suggests love, harmony and pleasantness in general, whereas Jupiter is the divine planet that signifies Krsna and His representative the Acarya, the spiritual preceptor. When Jupiter is associated with the Moon it colors the mind with beautiful, sublime and noble thoughts. I just want to mention one more thing before ending this brief analysis which may be interest to students of astrology, that Ketu, the "moksha karaka" significator of spiritual emancipation (not to be confused with Advaitic misconceptions of the same) is in the 9th house of dharma in Pisces a sign closely associated with moksha and atmanivedana (offering one's self to Krsna) exactly trinal to his Lagna and a little less so to his Jupiter. This is highly suggestive of a significant spiritual occurance. More could be said but since the main audience of this text are not students of astrology I will stop now. "I so hope at the time of your death you were remembering Krsna and as such, you have been promoted to the eternal association of Krsna. If not, if you had any tinge of material desire, you have gone to the celestial kingdom to live with the demigods for many thousands of years and enjoy the most opulent life of material existence. From there you can promote yourself to the spiritual world. But even if one fails to promote himself to the spiritual world, at that time he comes down again on the surface of this globe and takes birth in a big family like a yogis' or a brahmanas' or an aristocratic family, where there is again chance of reviving Krsna Consciousness. But as you were hearing Krsna-kirtana, I am sure that you were directly promoted to Krsna-loka." Therefore, taking everything into consideration it strongly suggests that Brahmananda Prabhu left his body (after only an extremely brief illness) in the highest possible consciousness leading to an inevitable destination. May we all be so fortunate. I am very sadden by the loss of Brahmananda Prabhu and pray that he will bestow his kindness on me and bless me with the same love, devotion and loyalty to Srila Prabhupada that he had.